Chandra Gupta II (reign ca. 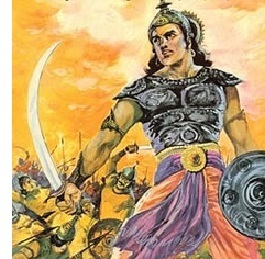 380-415) - Another powerful monarch of the Gupta empire and Samudra Gupta's son, many consider Chandra to be on par with his father in terms of his stature. During his reign, India is said to have reached the pinnacle of its power and influence. Art and culture flourished. This was reflected in Chandra's own court, which employed a group of scholars and artisans from several vocations. They were so highly regarded intellectually that they became known as the Nine Gems (there must have been nine of them). Not all their names survive, but two which do are Kālidāsa, who many consider the greatest writer of the Old Sanskrit language, and Varāhamihira, astronomer and mathematician. Chandra continued to conquer parts of India where his father left off. Two regions of the subcontinent which had escaped Samudra's reach were the west and the southern Deccan territory. The Gupta Dynasty had to contend with a very able monarch to the west named, Rudrasimha III. Ramagupta had tried to conquer him, but failed. Chandra finally defeated him in 395 though, to add Gujarat and Saurashtra to his empire. This gave the empire a foothold on the West Coast of India and brought it in contact with western civilizations with which it conducted trade. While Chandra did not conquer the southern tip of India, he made an alliance with the Vakatakan Dynasty which dominated it. He did so through the marriage of his daughter, Prabhavatigupta, to its ruler, Rudrasena II. The Gupta Empire was officially a Hindu nation, and this is where its art and culture was primarily focused. However, Chandra was known to be supportive of both Buddhism and Jainism, and art from these two religions made significant strides as well.